Each phone number or unique receipt is eligible for one survey completion (or mail-in entry) and one entry per day. Customer survey sweepstakes starts from the first day of the month and ends on the last day of the month. A maximum of one Daily Sweepstakes prize will be awarded per person per 90 days. You don 't need to purchase to enter or win, or complete the survey to enter. A purchase or completion of a survey will not increase the chance of winning. PC/Notebook usability rating: 5/5. About 5 minutes to finish, 2 open questions, need receipt. Tablet usability rating: 4/5. No mobile page for Tablet. 2 open questions, need enter personal information. Smartphone usability rating: 3/5. No mobile page for smartphones. You can still finish Morrisons CustomerSurvey via smartphone, it may take more than 5 minutes to finish. Online. 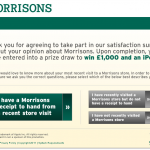 Customers who have a Morrisons receipt can visit Morrisons Customer Survey official website to take the survey. Mail. Hand-write the following sentence "Please enter me in the Empathica Daily Sweepstakes for a chance to win one Daily Prize" on a sheet of paper on which you have hand-printed your first name, last name, home telephone number, full address (no PO Boxes accepted), email address, and the name of a participating client and mail it in a separate envelope with sufficient postage to: EMPATHICA DAILY SWEEPSTAKES, One Victoria Square, Birmingham, UK, B1 1DB. Select answer to the question "Which of these areas do you think was the poorest?" Select answers to the questions like "On this visit, did you use a self-service check-out?" Select answer to the question "Would you like to answer more questions?" Morrisons is one of the the UK's largest food retailers. There are more than 400 stores serving people. You can find a store near you online easily. Morrisons ' business is mainly food and grocery. They offer a variety of useful services such as dry cleaning and photo printing, too. If a product bought at Morrisons fails to please they will always offer a refund or a replacement to the value of the product(s) originally purchased. Morrisons would love to know about more of your recent visit to one of its stores. I visit the Queensbury store weekly. The staff are extremely friendly,professional and helpful. They welcome customers with a cheery hello and will go out of there way to help. I visited today at 10:00 but normally visit on a Saturday late morning you get the same high standard of service whenever you shop. Was served by Kerrie on the deli at Halfway Sheffield this week. Very helpful and served with a smile. Good customer service and very helpful staff. I have been a morrisons shopper for a number of years now and buy many own brand goods ,however I have a complaint about the quality of Even Softer Toilet Tissues , they don't seem to be that soft anymore and the perforations are a joke ,we are forever trying to get the two layers so that its soft side up , I thought maybe we had just got a bad batch but unfortunately this seem to be the norm for this product now and I will be buying an alternative in future . We find all of the Morrisons Stores we visit in Bransholme, Goole, Beverley and Ecclesfield to be of a good standard with a wide choice of goods and competitive prices. Can usually get a wider selection of biscuits for cheese and continental meats from all stores, which is not the case at Asda or Tesco. Also all the Cafes at Beverley and Ecclesfield are very good and excellent value with a wide choice to suit all age groups. Also the staff are very helpful and the Cafes are clean and tidy. I am annoyed (again) with Morrisons Huddersfield. Once more billing is incorrect with regard to offers. This week its meat. The 3 for £10 offer was not coded correctly and I was charged £12. After queing at Customer Service it was put right. Clerical error I was told. Last week childrens sweets at 32p each or 4 for £1. Charged full price. Didn't spot that one. Three weeks earlier it was Kenco coffee. £5.99 full price, offer price £4. Charged the full price. Either Morrisons have got a terrible computer system or they are trying it on with their customers. I am rapidly of the opinion its that latter. Patience wearing thin now, despite their new pricing policy. I am writing to express my thanks to the excellent service I received from Cath in the Flower section of Morrisons at Portobello Road. I was reading the Evening News I discovered that an old friend had died. The funeral was the following day at 9.30am. I thought I would never be able to get a flower at such short notice. I called Morrisons at 8am to see if they did flowers for funerals. I was put through to Cath in the flower section and I explained my dilemma. She told me not to worry that she would make me something up and I could collect it at 8.45. I was delighted with the result and could not believe that she had managed to make me such a beautiful arrangement in such a short space of time. Everyone I have told this story to is very impressed with the service I received. Cath you are a lovey person and an asset to Morrisons. Thank You. Up to now I have made ten dozen mince pies. With the first two dozen I bought four different makes of mincemeat and did a blind tasting test with family and friends. Everyone chose Morrisons own Signature boozy brandy and port as by far the best beating a luxury brand costing double the price. Needless to say the remainder of the pies have been made with your own brand mincemeat wonderful value and quality. When we visit your store in Glastonbury it is like a breath of fresh air, you walk in the door and the lady who is in charge of the veg and fruit section always greets you with a hello you two how are you and is always smiling, the ladies on the deli counter always have a laugh and joke with us and Dave on the butchers counter is one of the nicest person we have ever met, very efficient but amusing, when you see little children in prams wave to him and say hello Dave is something we have not seen in other supermarkets. The only thing I can say is that they all look as though they all need new uniforms, which is not there fault. Morrison s is all in all a good shop. It provides the food, utensils and entertainments you need. However, the lack of trolleys are not helpful especially during a busy day such as Sunday. Apart from that, the quality of Morrisons is excellent. Still use Moeeisons but i will admitt Aldi is where the bulk of our shopping is carried iut, veg better quality,meat has inproved a great deal and cost ha become the major thing . A shop a Aldi on average will cost around £35.00 against a simular shop ay Morrisons will come in at around £50.00 or more . Even the wine department sa es us moey and the quality again is excellent. Need i say more i dont think so. All your staff has always been most helpful to me. The supermarket is our favourite. while shopping today I found the staff very helpful and friendly. when i went to the store none was available and was told it "may come in later" in the last week white and mckay whisky has been advertised at £17 per ltr. i have visited the store twice and again none in stock .i questioned two members of staff ,both of them had no idea as to the offer,where it should be or when it would be available.so i am afraid i have paid my last visit to morrisons. service was good both on shop floor and the till will be back for some more , 10x better than tesco's !